Feeding the family has never been so easy, thanks to one of Hoover’s latest built-in ovens. Exclusive to Euronics and Agent stores, you won’t find this great model anywhere else. And, selecting a function is simple with the easy-to-use dials and touch control LED display. You can even set the start and end cooking times so your meal is ready for whenever you are. Plus, with the integrated variable grill, you can adjust the grill temperature for your convenience. 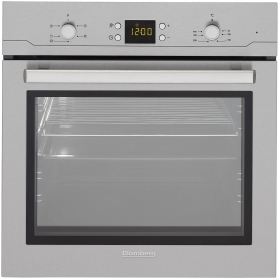 Finished in a modern stainless-steel, this Hoover oven is a stylish and essential addition to every kitchen. Keeping the HO8SC65X sparkling clean is simple thanks to Hoover’s innovative design. Take advantage of the Hydro Easy Clean programme – just pour 300 ml of water into the bottom of the oven and set to the relevant programme and temperature. Then, you can let the generated steam remove any fat or food particles. You’ll also be able to remove the double glazed door to soak off any stains or spots in your sink. And, the oven’s interior enamel lining makes wiping it down a breeze. You’ll also love the soft close door hinges –when the oven door is within a few inches of closing, the feature activates and gently closes the door. Say goodbye to slamming and trapped fingers for good with the HO8SC65X. Plus, thanks to this Hoover oven’s bulb light, you can keep an eye on all of your dishes easily. The embedded cooling fan also means your oven will return to a safe and cool temperature quickly, once you’ve served up. 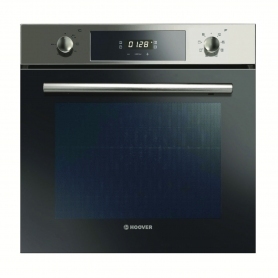 Rated ‘A’ for energy usage, this built-in oven from Hoover is ideal for every home and family. Make mealtimes enjoyable again – add the HO8SC65X to your basket today.